Guys! Guys! I MADE A BOOK TRAILER!! Ok, just look at it! I’ll tell you all about how I did it and how much it cost (in terms of time and lost hair) right after, I promise! So, how did I do that? How much did it cost? Did it make any impact on sales? I made the clip myself, at a total cost of $0 and about 10-12 hours of customising, watching tutorials and searching self-help forums. The clip was created with Adobe After Effects CC , and I started the process with a free template from After Effects Templates and added “Playing to Win” soundtrack from Free Stock Music. Easy-peasy, right? If you don’t mind, I’m just gonna whine a bit now. If you’d rather focus on the positive stuff, just skip the following paragraph. Once my nerves settle, I may try it again – in fact, I was thinking of perhaps running one of the free giveaways with the option of either a book cover or a book trailer. Again, if this interests you, make sure to sign up for the Don’t Miss It! email list (see the floating banner on the right). Gotta go look at the trailer one more time…nope, it does not get old! Marketing blitz reveal – so how did Robin Read, Indie Book Promo, and Book Gorilla perform? 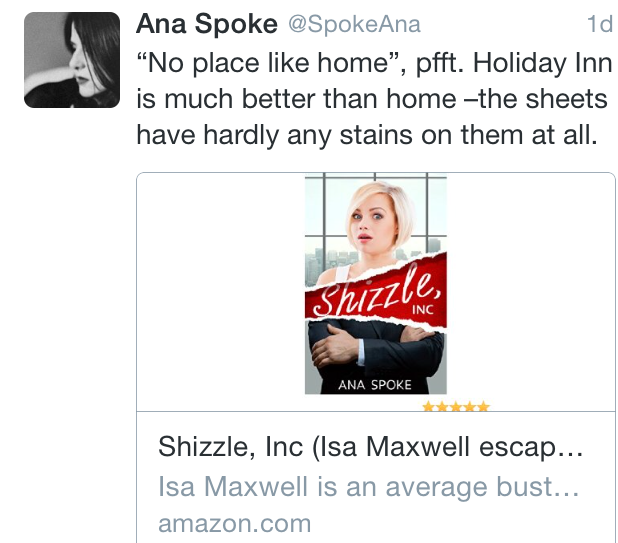 Hope your Thanksgiving was great – I didn’t get any turkey down here, in Australia, but Shizzle, Inc did get to #9 on Amazon’s Satire Bestseller list! Not quite the #1 that I was hoping for, but hey! Single digits! I couldn’t be happier. Not everything went according to the plan, but a negative result is also a result, as scientists say, and you get to benefit from all my experiences, whether good or bad. Indie Book Promo – 27 November. Cost: $25. Sales on the day: 3. Book Gorilla – 28 November.Cost: $50. Sales on the day: 46. These numbers are quite disappointing, especially when the previous $25 promo with eReader news resulted in 63 sales and covered the cost. It could be that it’s not a good idea to advertise over a major holiday, especially the Black Friday. I might give RR and BG another try, although I’m completely disappointed in Indie Book Promo – I have contacted them and they promised to send me some stats, although their attitude was that they are a different model to an email blast, and that’s just that. Well, I have not seen any evidence that they’ve made a dent on the day or today, so I will take an email blast with results that I can see any day. In the future, I will not bother with any website banner advertisements, seems that a targeted email is the only way to get people to notice. So far it looks like the promo resulted in at least 1,561 extra pages (and hopefully more in the near future!). At roughly half-cent per page, this amounts to another $7.80 or so, so the total loss is currently at $68.40. Hopefully it will continue to reduce as people keep on reading. And if it’s one of you – please, please post a review! I’m up to 18, but it takes 25 reviews to advertise with some of the marketing sites I want to try. 5 December – second chance for Bargain Booksy. They were nice enough to give me $25 credit for the disappointing YA audience promo, so I’m trying the chicklit audience. Cost – $70 (minus the $25 credit). 5-6 December – applied to Read Cheaply. 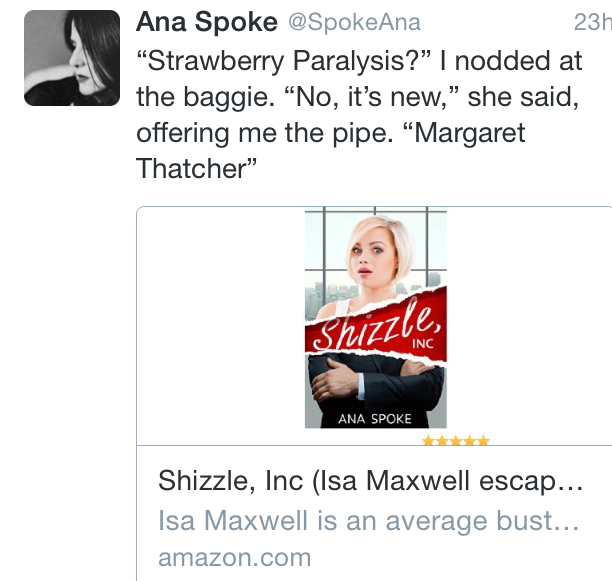 Not sure if this will work, as they want a limited-time offer and Shizzle, Inc has been on sale for many weeks. 7-8 December – Read Free. Cost: free! 9 December – Free Kindle Books and Tips. Cost – $25. 11 December – Reading Deals. Cost: free! 12 December – BookHearts. Cost – $5. 14 December – eBook Lister. Cost – $25. 15 December – BookSends. Cost – $30. 17 December – Digital Book Today (Deal of the Day). Cost – $30. Let’s see what that does! Ka-boom! Shizzle, Inc got up to #23 on the free Top 100 in Humor on the weekend! In fact, it stayed in Top 100 the entire time, thanks to you my dear readers and supporters. I was overwhelmed to see all the messages on the blog and retweets on Twitter – thank you so much!! I couldn’t be more excited. I mean, I could be, of course. Like, if Cohen brothers called me and told me they want to make Shizzle, Inc into a film, I would totally lose it. For now, I’m just trying to function as a normal, middle-age adult, with a job and other responsibilities. Trying to get through my workday without giggling like an idiot has been a challenge. Also, trying not to turn every conversation into a discussion of self-publishing is proving to be nearly impossible. Back to the topic at hand. Oh, the exciting times of marketing my novel! Most other writers blog about how much they hate this part of the writing-publishing projects, but I don’t get it. I can’t wait to implement my marketing strategy and see what results it may bring. Although, to tell the truth, I don’t have a strategy per se, at least not yet. All I have is a long list of gimmicks I’m going to test and blog about. So, how did I do by spamming the entire world with these quotes and passive-aggressive attempts to get unsuspecting folk to buy my novel? 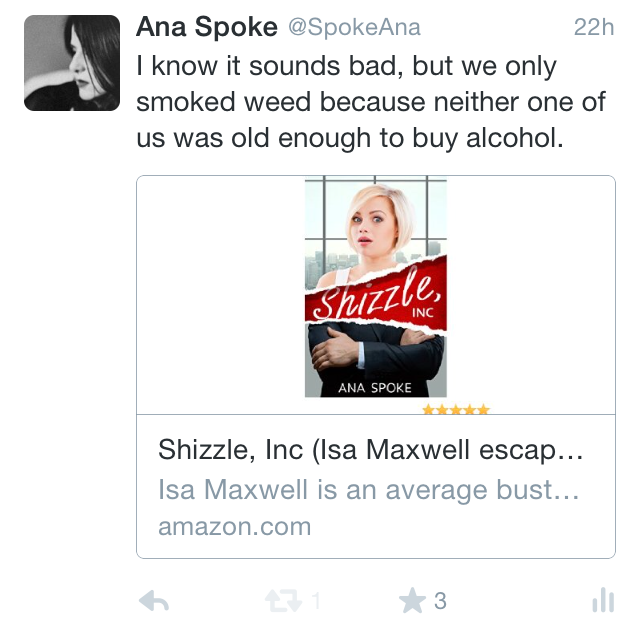 When I’ve looked at Twitter Analytics statistics, my first thought that the this particular gimmick backfired. Yes, the average number of views went up to 7,200 per day. Over 7 thousand views each and every day! In the previous weeks, my average views per day were around 4 thousand. So far so good, right? Well, not exactly. These quotes/links did not get very many likes or retweets. In fact, the average rate of engagement dropped from my long-term average of 4-5% to about 2.1%. That’s an indicator of how many people have actually engaged with the tweet by either retweeting it, liking it, clicking on the link, or viewing my profile. I stopped giggling long enough to consider abandoning this gimmick, until I checked how many “link clicks” I got. And this is where I finally saw some good news: the number of link clicks per week jumped from an average of 100 to 293. People actually clicked on the links! Considering that an average cost per click in advertising campaigns is $0.50, I’ve saved about $150 on advertising during the last week alone. So I’ve decided to continue with this for now, unless you tell me that you’re sick of seeing quotes from Shizzle, Inc. In case you’re interested, I am doing it using a free version of Buffer – a website that lets you schedule tweets ahead of time. The free version lets me schedule up to 10 tweets and I can choose to send all 10 of them in one day, if I want to. I’ve reduced the number of these spammy tweets to 4 per day – I will let you know what effect it will have on the number of engagements and link clicks. Most importantly, I will let you know the effect it will have on the number of sales. Stay tuned – I’m working on a post revealing exactly how many sales it took to get into the Top 100 list – the number may surprise you! How do I love thee, Twitter Analytics? Let me count the ways. I love thee, for you measure improvement. For without you, I wouldn’t have a clue whether my particular Twitter joke wasn’t funny or just got lost in the noise of a million voices. But most importantly, because you fill my heart with stupid, unwarranted hope that one day Shizzle, Inc will be discovered. 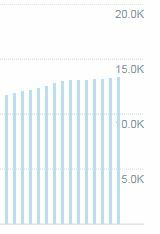 I’m crashing on Twitter Analytics like a stalking teenage girl. I can’t go for more than a couple of hours without checking stats, but there’s more to it than the OCD (I hope). It’s actually useful. If you’re using Twitter for anything other than reading random stuff, you have to get it. Right now. Stop reading this, there’s nothing else useful in the rest of this babble. The most amazing thing is that all the data and analysis in TA is free. There isn’t a catch, like you have to spam your followers, or drag in your friends, or give up the cash you have not yet earned. And it’s broad, covering analysis I did not previously consider, like engagement rate. 3. TA holds a promise of the day when it all goes completely viral, like this spike of over 30,000 hits (yes, I double-checked the number of zeroes). All it takes, apparently, is for a famous musician with a million followers to retweet one of your tweets. Which makes me ever so grateful, even if he refuses to follow me back. That sums it up for me. There’s also WordPress stats, but I’m sure you know all about them. You don’t? Omg, go check them right now! You can thank me later.